Produced For – ON Associates Music Publisher Ltd. Released with an insert in a transparent yellow plastic sleeve with the AIR logo printed on it. The sleeve is actually Green with fragrance(of forest) as the title suggests. 非売品 (Not for sale) printed on labels. There's pressing issues, but it actually sounds better after a round of cleaning with a Vinyl Vac. “Mori No Yoake” is the name of A1 and appears to translate into English as something like “Dawn in the Forest”. Google Translate offers “Along the creek” as the translation of A2 and “Bird kite Chino Cafe” as the translation of A3. B1 is translated as “Sparkling waters”, B2 as “Eitaira line of gull” and B3 as “Star of sand”. This was commissioned and given away at a launch event in 1984 for a perfume made by the Shiseido cosmetics company and each copy was presented in a green bag liberally sprayed with the scent. It will likely still linger on copies today. From both my own experience and a couple of things I’ve read, it would seem that all copies are very badly pressed and so had obvious hisses and crackles when new. Correct me if I’m wrong though. The music is beautiful, as is the artwork. 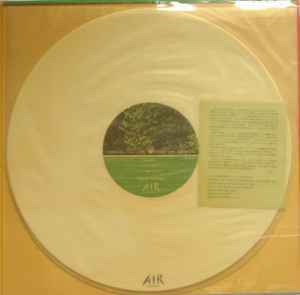 Is the English title something like "Air in Resort" (appears on the label)?